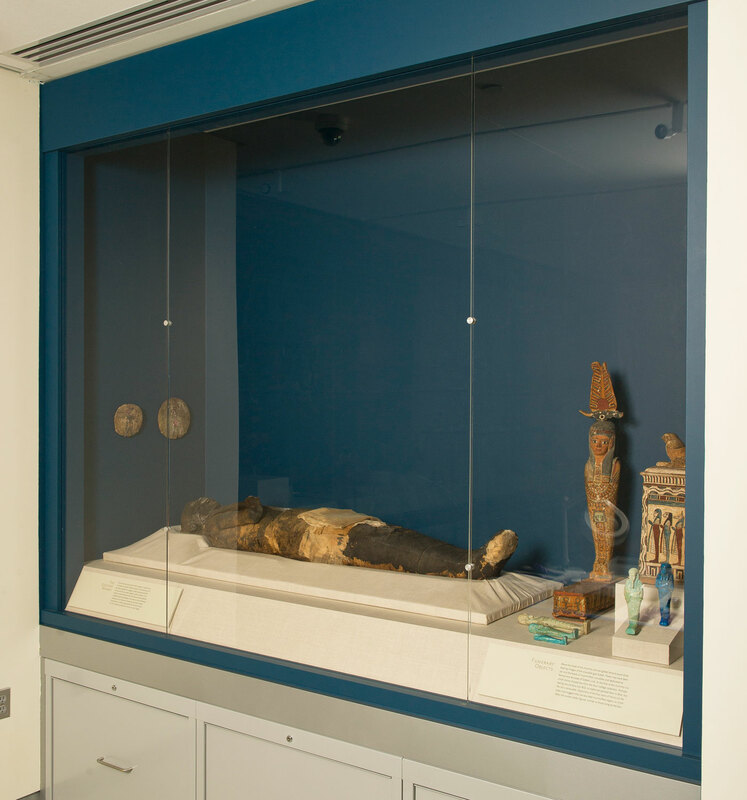 The Goucher mummy as currently displayed in the museum. She is surrounded by funerary objects which would have typically been placed with the deceased. Image courtesy of Goucher College. The first attempt to unwrap the mummy took place on August 16, 1895, when Dr. Goucher revealed the ears and right arm from underneath the linen and resin wrappings of the body. At this time, the painted wooden coffin that the mummy rested in during her voyage from Egypt to Baltimore was removed; its current whereabouts are unknown. It is unknown when the mummy was unwrapped further, making her face and upper body as well as part of her feet visible. There is also no information as to whether the painted linen and plaster cartonnage placed over her torso actually belongs to the mummy or was placed there at a later date. In 2007, the mummy was conserved to ensure that loose linen fragments as well as areas of the detached resin coating were stabilized to ensure that no additional material was lost. The conservation treatment attempted to return the mummy to as close to her unwrapped condition as possible. Since most of the original linen which covered her upper body was missing, the remaining areas were returned to their original locations as possible and covered with a see-through conservation textile known as Stabiltex. The textile was only minimally sewn in place over areas of detaching linen and then gently folded under more stable resin-covered areas. Areas of loose resin were adhered in place using a conservation-grade acrylic resin, Acryloid B72, and further patched with small bandages of archival Japanese paper to hold them in place. Conserving the feet of the mummy. Left: The feet prior to conservation treatment; Center: During pinning and encapsulation of the linen wrappings; Right: After conservation showing the wrappings held in place. The mummy is currently displayed in a darkened niche within the museum’s climate controlled space and is regularly monitored to ensure that it is kept under stable temperature, relative humidity, light and ultraviolet light conditions. As it was unclear whether the cartonnage found on the mummy’s lower torso actually belonged to her originally, it was conserved and then stored separately until such provenance might be established.